This french computer has some IBM PC compatibility. It can read PC disks with a special software and has ISA expansion slots. But it's not a real PC compatible machine. It is more powerful than its little brother, the AX-20. But historicaly, the AX-25 was conceived before the AX-20, though it was marketed later. Two models were available : the AX-25A with two 5"1/4 disk drives and the AX-25B with one 5"1/4 disk drive and a hard disk (10 MB). The disk capacity is quite impressive for its time: 2,7Mb. The drive uses special 192 TPI disks and was conceived by Drivetec (USA). Technically, there a kind of mix between hard-disks and classic floppy drives. The AX-25 is also quite fast with its clock-rate at 8 Mhz. The AX-25 is sold with a text editor built-in: AED. It is a pictogram driven software and you could even use a mouse with it, just like with the brand new Macintosh (1984). If you hadn't a mouse, you could use the 8 function keys which were directly mounted on the monitor, at the bottom of the screen ! MicroSoft Basic, MicroSoft Word, Multiplan and Micropro software (including Wordstar) were available for this machine. 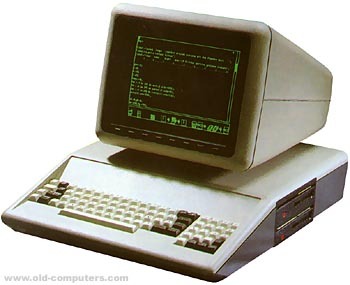 The main operating system was MS-DOS but CP/M 86 was also possible as an option. M Basic was sold with the system, but Business Basic, Pascal, Fortran, Cobol and C were also available. 8 programmable function keys on the monitor ! see more Axel AX-25 Ebay auctions !